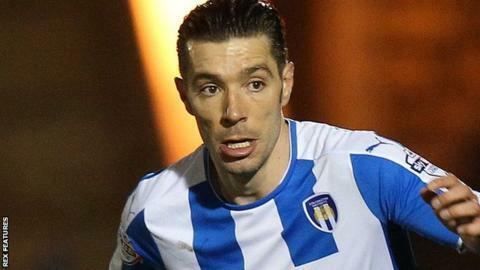 Darren Ambrose's double helped struggling Colchester United come from behind to win 2-1 at Bradford City and end a 19-game League One winless run. Bradford, chasing a play-off place, went ahead when Wes Thomas converted Josh Cullen's pass, but Kevin Keen's side levelled through Ambrose's volley. Buoyed by the leveller, George Moncur struck an upright, before Ambrose took Owen Garvan's pass to make it 2-1. It was enough to secure a double against the Bantams this season. The win was Colchester's first in League One since a 2-1 home success against Port Vale in October, and Keen's first in the competition since his December appointment. Phil Parkinson's side dropped two places to ninth after the defeat, their first in five. Match ends, Bradford City 1, Colchester United 2. Second Half ends, Bradford City 1, Colchester United 2. Owen Garvan (Colchester United) wins a free kick on the left wing. Foul by Jamie Proctor (Bradford City). Joe Edwards (Colchester United) wins a free kick in the attacking half. Substitution, Colchester United. Jamie Harney replaces George Moncur. Owen Garvan (Colchester United) is shown the yellow card. Attempt missed. Tony McMahon (Bradford City) right footed shot from outside the box is close, but misses to the right. James Meredith (Bradford City) wins a free kick in the attacking half. Corner, Bradford City. Conceded by Leo Chambers. Lee Evans (Bradford City) wins a free kick on the left wing. Rory McArdle (Bradford City) wins a free kick on the left wing. Chris Porter (Colchester United) wins a free kick on the right wing. Substitution, Colchester United. Macauley Bonne replaces Darren Ambrose. Substitution, Bradford City. Jamie Proctor replaces Nathan Clarke. Corner, Colchester United. Conceded by Nathan Clarke. Tony McMahon (Bradford City) wins a free kick in the defensive half. Corner, Colchester United. Conceded by Ben Williams. Attempt saved. Alex Gilbey (Colchester United) right footed shot from outside the box is saved in the bottom left corner. Attempt saved. Lee Evans (Bradford City) right footed shot from the centre of the box is saved in the centre of the goal. Corner, Bradford City. Conceded by Joe Edwards. Attempt saved. Kyel Reid (Bradford City) right footed shot from the left side of the box is saved in the centre of the goal. Attempt missed. Billy Clarke (Bradford City) right footed shot from the centre of the box is close, but misses to the right. Kyel Reid (Bradford City) wins a free kick on the right wing. Substitution, Bradford City. Mark Marshall replaces Wes Thomas. Substitution, Bradford City. Billy Clarke replaces Josh Cullen.